So, you don’t like the fact that I don’t blog regularly? I’m not the type of individual who gets offended easily. Most of the people who know me say that it is often just the opposite…I’m too easy going at times, too forgiving (if that is possible, huh? )…always looking for the best in people. 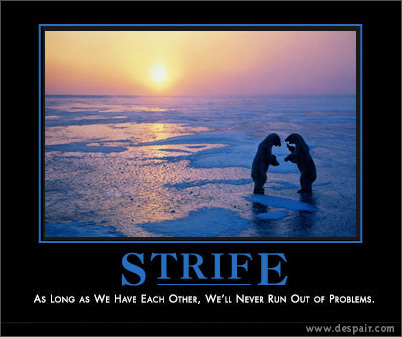 Frankly, because I’m a well-rehearsed codependent, I take on way too much of other people’s “stuff” simply because I’m a nice guy. Right! Even so, I found myself deeply offended while I was thoroughly investing my time in reading the cover article from last week’s Time Magazine, “Does God want You to be rich?” Little did the publishers of Time realize that while they were busy assembling their magazine for publication with that particular cover article that I would be in the middle of reading a very good book on World War 2 and the battle of Iwo Jima, “The Flags of our Fathers” (which will be soon released as a movie that Clint Eastwood has had his hands in). Well, back to the story…I found myself ashamed while reading the Time article. I was ashamed of being a Christ-follower in America knowing that this magazine has a very extensive readership not just in the USA but also around the world. I tell you, if THAT is what is being portrayed to the United States and to the rest of the world as a vital “snapshot” of the American brand of Christianity, I seriously want no part of it. Now understand me, I’m not trying to be a whiner like my son Aaron sometimes rightly accuses many leaders who are looking at living and leading a new paradigm of Christianity of being. In this case, whining has nothing to do with it. This article gives incredible insight into what is most likely the number ONE problem with the American Church…it’s wholehearted sellout to consumerism, materialism, and a manner of doing “church” that completely distorts the truth of the scriptural narrative which embodies the faith. John Kavanaugh is right when he writes in an extremely profound and prophetic book, Following Christ in a Consumeristic Society, that a “consumer society is a formation system: it forms us and our behavior…we are what we eat, what we build, what we buy”. He goes on to say that we are being transformed NOT into living ambassadors and present day “incarnations” of Jesus but into the very “idols” we trust. I couldn’t help but think of many, many of the things that I have been exposing my mind and heart to over the past months about the issues that are undermining the American brand of Christianity. In my mind, the dicotomy that existed between the pictures that were being painted in my imagination over the two writings: Flags of the Fathers being about sacrifice, commardery, passion, and vision. Flags of our Fathers describing how one battle over a course of a week saw the death/injury of close to 60,000 Americans and Japanese many of who were under 20 years of age, and how our country at that time expected every man, woman and child in America to be part of “war bond” issues (at $100 per person) that provided the conflicts with needed financial resources at a time when the average family made close to $5000 a year. I was simply overwhelmed when a story like that was juxtaposed against the Time artlcle that raised up the “values” of self-indulgence, consumerism run rampid, self-satisfaction, self-focus, and self-motivation as leaders in churches struggle not against bullets and death but against a prevailing scriputural hermeneutic of sacrifice and humilty as they shamelessly promote visions of granduer and plenty. 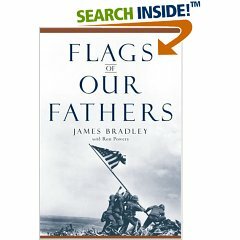 The “hero” of the Flags book, Jack Bradley, didn’t worry about his notoriety as he helped hoist the stars and stripes on the pinnacle of Mt. Serubachi with five other comrades…he wasn’t thinking about selling millions of books once his story got published or how he could manipulate the media in order to mug for the camera. I read this very humbling story about a man who didn’t even count himself as a “hero” in the battle of Iwo Jima despite helping young men scores who were wounded or dying with no regard for his own safety or status. He knew the truth – the real heros of the battle were the ones who never made it home but gave their lives for freedom. I read that and then I looked over at Time and the pictures of our “brothers” in the church as they posed in the best of light, many of their pictures “air brushed”, bathed in just the right light to bring out the best photographic image…most of them, very wealthy even by American standards, and I thought, “we really don’t have a clue about reality, do we?” I humbly ask for you to consider this – how do you think God “feels” abou tthe American church? I am now more and more convinced that God must be ashamed at the American Experiment. More and more the scriptural images that come to my mind when I think about the state of American and the American “church” that most people know is that of the Harlot in the book of Revelation. Again, I’m not trying to jump on some apocalyptic bandwagon here…all I know is that modern American looks and feels like ancient Rome at the time when Revelation was penned. Maybe we are the great Babylon…maybe we wouldn’t know humility, honesty, and sacrifice if it hit us in the face. The American Church is known for too many celebrities and not enough servants. The Amercan Church is known for too many mega-buildings, stars, properties, offerings, book deals, etc. and not enough authenticity of sacrifice and love. I don’t know…maybe I’m getting a bit jaded. 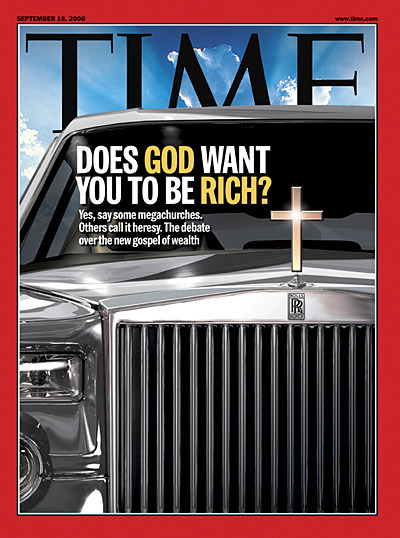 All I know is that it would make a big difference if Time magazine would have to focus on other issues in the faith as it attempted to summarize what is going on in a majority of pulpits and pews of the United States. Wouldn’t it be helpful if we saw a cover article that said, “Does God want you to Die?” or “Does God want you to be poor?” or “Does God want You to be Humble?”. I’m believing more and more that the real “heros” of the faith these days are not the ones leading big churches and big ministries and talking about whether God wants to fill our wallets and driveways and lives with more and more stuff. The real heros are the ones who are daily giving their lives to a Kingdom that stands for values other than those frequently epitomized in our culture – the values of meekness, gentleness, patience, love, servanthood, humility, poverty of spirit, strength in the face of suffering…the real heros are the ones who sign up to be part of the “fellowship of suffering” (Phil. 3:10) not those who are looking for more and more of the cultural “action”. Here’s something for you to do – why don’t you read the Time article and let me know what you think (article here). I’m ranting a bit here…but I think it’s merited. I love engaging people in a discussion about sacred space. You know what I’m talking about…there is a dictomy in the Christian sub-culture about what is “secular/Christian vs. sacred”. We have branded a number of things in our lives with one label or the other…”secular music”…”sacred sanctuaries”…”secular books”…”Christian books”…”secular Universities”…”Christian magazines”. One gets the impression that there are places where God “is” not. Unfortunately, God is everywhere. There isn’t a molecule in the universe that isn’t drenched with the presence of God. Because of that, there is no place that can be regarded as truly “secular” space. The presence of God is everywhere…we just haven’t recognized it or acknowledged it. Well, this post isn’t meant to be a vast discussion on omnipresence…it is rather to “announce” a vacation from blogging…yep, just when I was lamenting several days ago about not being able to post regularly, I now realize that I have to take a break from blogging because I am about to leave in order to “find God’s presence” on the island of Kauai. It seriously is a quest for clarification and to prove, once and for all, that the presence of God’s Kingdom permeates every place on the face of the planet. 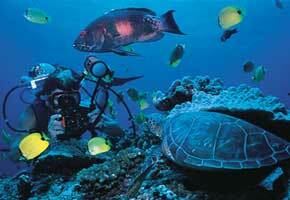 I have heard rumors that Kauai is a place where God dwells…I’m off for the next six days to prove it to myself. Truly, this is an intellectual exercise. So, pray for my discoveries. Frankly, this is real suffering in the Kingdom. I’d much rather just trust people with their ascertion that the presence of God is IN Kauai…but being a materialist, I have to prove it to myself. So, I’m off to suffer! Pray that my discovery pleases God and brings some closure to my intellectual issues. Ha! OK, so I have to admit that I’m not a very big Myspace.com fan. I was at first…I thought, in fact, that I might want to tap into the technological phenom as a manner of continuing the conversation and journey that I am on with over 450 high school and college aged students who are committed to being “called and gifted by God to be difference makers in their world to God’s glory (yli’s mission)”. But after I started my own account about 6 months ago, I was “prompting” propositioned be a few “younger women” online. Now, I’m not trying to brag about this…in fact, it was a huge upsetting part of my life at that particular time. I quickly revealed the “problem” to my pal and wife, Vicky, who “suggested” that Myspace.com might not be the space for my life. So, I quickly ejected. Even so, as time has gone by, I have logged in to myspace.com to check out what’s happening…much to my surprise and shock. As you know if you’ve been there, it is a mixed bag…delightful and downright evil. So you can imagine when my son (who is now overseeing the YLI website content a couple of hours a week) told me he was putting together (in partnership with Chay-dawg) a new YLI myspace.com account. Well, I just checked it out and it is pretty cool..videos, chat, announcements about yli events upcoming, fun pics…it’s all good. So, I’m going to resign myself to it at this point. Of course, the big discussion on the myspace.com account now is whether YLI is a male or female and how old…geezer or young pup? Oh well..so much for the internet. You can check out YLI’s myspace.com site @ http://www.myspace.com/yliapu. Don’t forget to check out our other site, Youth Leadership Institute. You see that right…been too crazy lately just playing the “work” game. I love the blogging but it just seems to go to the “bottom of the pile” too quickly. Oh well. Today’s thought is expressed by the picture above. Click on it and take a better look. We’ve been living in the flow of a faith community over the past number of months. I love what a good buddy of mine says about community, “everybody loves the idea of community until they are actually in one”. It’s true. Community sounds like a good idea…it is biblical, theologically consistent with God’s vision for our lives, and definitively relevant to this point in history. The problem is living it. I’ve known too many people who jump into the stream of community only to get too discouraged by the “messiness” of it. When Mike Yaconelli wrote the amazing book, Messy Spirituality, I wish he would have had the time in his life to write one entitled, Messy Community. I don’t know, maybe I’ll have to take that on. If you are thinking about community, don’t be too shallow in your contemplation to actually believe that community is going to be easy. If it was, everybody would be doing it and Jesus wouldn’t have had to say as many times as he did, “love your enemies…love one another as I have loved you”. I think if we all went into community expecting messes, we would be able to navigate it with more faithfulness and love. Community is God’s dream…we need to enter into it with boldness and in the spirit of prayer…we do need to love each other in a manner that is revolutionary and subversive. If you really want to make community happen, you are going to have to be dedicated to loving people in the journey of life in a manner that is radically different than the way 99% of the relationships that surround you operate. Because sooner of later, the relationship and community is going to get very messy. Unfortunately or fortunately (depending on your perspective), that’s really when community begins! We’ll see how much more I can blog this week. For those of you who visit this site often, bear with me!